Is this the most comfortable motorcycle helmet? For me, YES! For me, and my small, intermediate oval head (XS, 53-54cm), the Arai Vector-2 is a perfect fit. It cradles my head so perfectly and feels like it was made just for me. I chose Diamond White, which is a pearlescent white with little sparkly specs when it's in the light. The Vector was designed for someone who's head is longer from front to back vs. side to side. If you aren't sure where to start, you should measure your head (see helmet fitment guide link below) and start from there. Figure out which way your head is longer, side to side or front to back. When searching for a helmet, especially your first one ever, I know how difficult it can be to find something that fits well and falls within your budget. That's the #1 complaint I hear about helmets is how expensive they are. But isn't protecting your head/brain worth that investment? Think about something you spent $400-$500 on recently. Was it a fancy kitchen appliance? Fancy speakers? A new chair or a computer? Why is it so easy for us to drop money on superficial items, but when it comes to our delicate heads, the idea of spending a few hundred dollars is simply ridiculous? 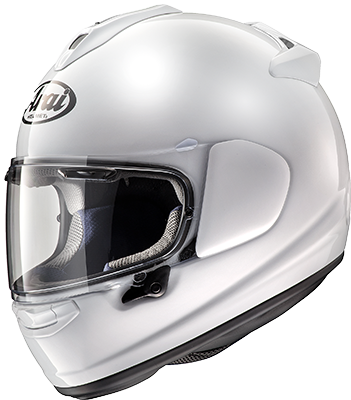 You don't have to spend more on an Arai, but consider spending a little more than the bare minimum. You really do get what you pay for when it comes to helmets. After sporting the Shoei Qwest for a year and a half now, I'm excited to wear an Arai again. When I first started riding, I remember trying on an Arai Quantum and knowing that it was the perfect helmet for me. But I just couldn't bring myself to spend the extra $ on my first helmet so I settled for something less expensive yet Snell certified. I knew that I was an Arai girl and I still am. Woop!